Ideally located on Tel Aviv's famous hotel strip facing the Mediterranean Sea, this completely refurbished and elegant Deluxe hotel offers the city's cultural, entertainment and business centers at your very doorstep. Dizengoff side-walk cafess and the Old City of Jaffa are just minutes away. 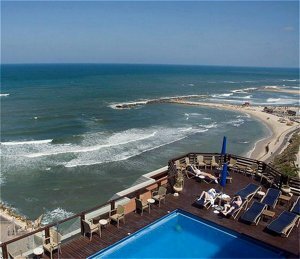 On the beachfront, next to Tel Aviv's Yachting Marina and only 5 minutes walk to the city center. 30 km to Ben Gurion International Airport, limousine service available. Taxi stand at hotel.